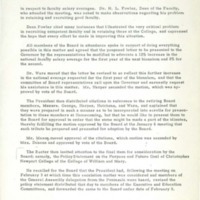 The statement of purposes for the Christopher Newport College of the College of William and Mary from July of 1961. 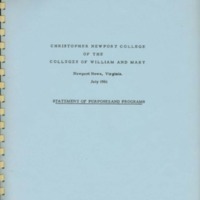 Christopher Newport College will be a four-year, undergraduate, degree-granting institution. 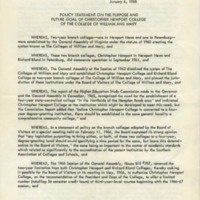 Discussion of Resolution CN-1, Policy Statement on the Purpose and Future Goal of Christopher Newport College of the College of William and Mary. 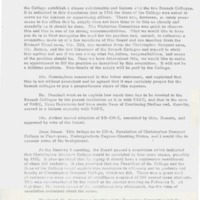 Discussion of the Policy Statement on the Purpose and Future Goal of Christopher Newport College of the College of William and Mary. 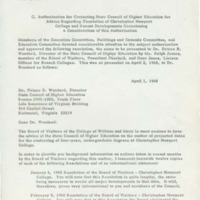 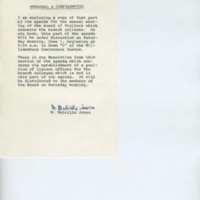 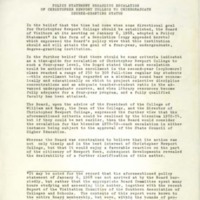 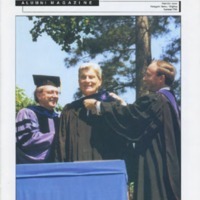 Copy 1 is labeled Approved by the Board of Visitors of the College of William and Mary in Virginia on February 9, 1968.